Grid Reference: OS Sheet 36 GR989059. Time: Day 1 - Carpark to Corour bothy 6 - 9 hours. Day 2 - Corour bothy to the carpark 7 - 10 hours. It puzzles me why some people will walk miles into a range like the Cairngorms just to get to the top of one hill before walking all the way back. With a tactical overnight kip you can get deep into the heart of these mountains. This was the theory, so, as we took to the hills on our maiden overnight expedition my foremost thought was simply the weight of my backpack. The Cairngorms are vast. This means that a day trip to some of the central munros is a massive hike. 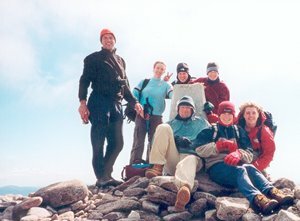 If you can rough it in a bothy or can tough it and carry a tent then in a 2 day trip you can visit the seven munros Cairngorm, Ben Macdui, Carn a' Mhaim, The Devil's Point, Cairn Toul, Sgurr an Lochain Uaine (The Angel's Peak) and finally Braeriach. For our expedition the weather was fantastic, windy and cloudless, resulting in a healthy tan without becoming midgie fodder. From the scale of this walk it's worth planning it for a good weather weekend.... hopefully you wont have to wait too long. But if the weather turns nasty for your second day there is the option of taking the lowland route home along the Larig Ghru. Hopefully the grey man of Ben Macdui wont slow your progress too much. Park in the Cairngorm ski area carpark (Multimap), at present this privilege is free, but you can expect to start paying in the near future. As the funicular building was progressing quietly we headed South East up through the ski area in Coire Cas and then straight up the Head Wall (which sounds more daunting than it really is). From the top of the Head Wall the summit of Cairngorm (1244m, GR005041) lies approximately 200m to the East. From the summit of Cairngorm follow the ridge in a south westerly direction for 2 km, then follow the path south for 4km to get to the summit of Ben Macdui (1309m, GR989989). Looking west from the summit there are dreamy views of the next days hillwalking. The southerly descent from Ben Macdui to the col (GR987973) will probably take you longer than expected from the map contours as the going is very rocky and it requires a lot of concentration. From the summit of Carn a' Mhaim follow the ridge SE for a few hundred metres, then head west down the steep grassy slopes to get to the path that leads northwards to Corrour bothy (GR982958). For us this is where Day 1 finished. The bothy is pretty basic.... but that's all it's meant to be. It provides windless shelter where you can cook your supernoodles. With a bit of luck you too may encounter a cheery group of Duke of Edinburgh boys intent on burning all your rubbish with their vast supplies of meths. From the bothy head west up the path to get to the col, then follow the ridge East to get to the summit of The Devils Point (1004m, GR977952). This short steep ascent should take little more than an hour. From the Devils Point return to the col, then follow the rough track that follows the line of the crags North then west then north over the boulder field to the summit of Cairn Toul (1291m, GR964973). 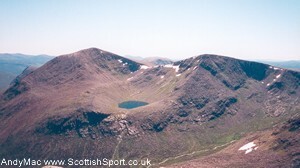 From Cairn Toul follow the track NW along the ridge to get to the summit of the newly appointed munro, The Angels Peak (1258m, GR954977). From The Angels Peak follow the track that runs west along the crest of the ridge and then bears north for just under 2 km before leading you east to the craggy summit of Braeriach (1296m, GR953998). The track to Braeriach is very sketchy in places so in misty weather good compass work will be particularly important. From the summit of Braeriach it's a straight forward but long walk back to the car. Follow the clear track west then north over the top of Sron na Lairige. This was one of my most memorable walks. The scenery was fantastic and the 2 day option meant that it became an enjoyable but challenging walk and not an out and out 12 hour slog. After all, the most important bit is soaking in what the Scottish mountains have to offer..... as long as the weather actually lets you see it.